The Muslim Turkey Drive has provided Thanksgiving dinner for needy families for at least 15 years. The man at the center of this initiative is Jihad Shoshara, a physician who took the helm of this drive from its founder nearly 10 years ago. Under Shoshara’s leadership, the Muslim Turkey Drive is able to feed more families in more locations, including the Grand Crossing and Auburn Gresham neighborhoods. This year, the volunteers distributed more than 5,000 turkeys. One of the drive’s partners is Sabeel Food Pantry, reportedly the area’s first Muslim-run food pantry. It feeds the needy all year round and is run by the Islamic Food and Nutrition Council of America (IFANCA), which has been involved with the turkey drive since 2009. When IFANCA got involved, the Muslim Turkey Drive, which gives turkeys to anyone in the community, regardless of their faith, was distributing a few hundred turkeys a few days before Thanksgiving. Shoshara bought the turkeys himself at wholesale prices. IFANCA not only helped the drive increase the number of turkeys they distributed, it helped spread the word as well about the drive to get donations. From 2009 to 2015 the distribution increased from 500 to 1500 turkeys, said Asma Ahad, IFANCA’s director of Halal Market Development. 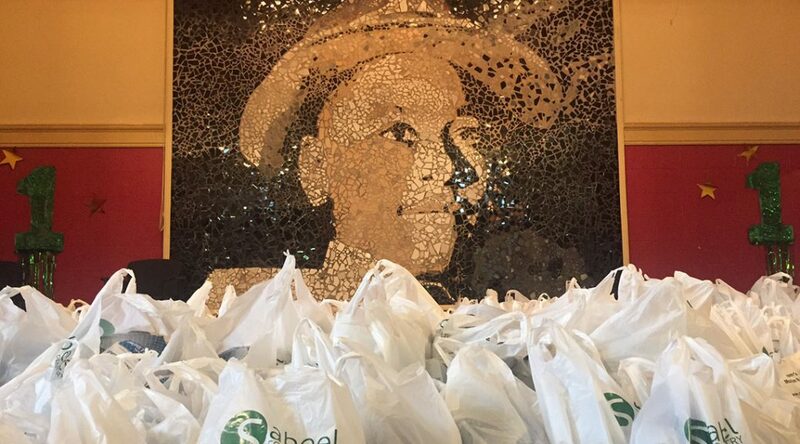 The donations also expanded from providing turkeys solely at Emmett Till to eight schools. Shoshara also works with the Inner-City Muslim Action Network (IMAN), a non-profit which offers social services, including a free clinic, to members in South Chicago. Turkeys are given to IMAN and they distribute them to needy families in their neighborhood near West 63rd Street. According to their press release about the event last year, they distributed 120 turkeys to Fairfield Elementary Academy. This year the group was able to reach its goal of distributing 5,000 turkeys. IFANCA also vowed to match every dollar donated to this drive, Ahad said. Lyne, a retiree who did not want to give her last name, was one of the recipients. She said she knew the donation was from Muslims. “We’re all people of color and the sooner we understand, the better it will be for all of us,” she said. She added “salam alaykum” as she went into the school to collect her turkey. Shoshara stresses that Muslims were happy to help when he told them that helping others was part of their faith. “Helping our neighbors in need showcases the best aspects of our religion,” he said, adding that it also reaches a demographic Muslims don’t have access to. “It’s about benefitting people,” he said. Shoshara’s commitment to the drive stems from his having attended Chicago public schools in this area. When his family moved to the suburbs, he saw the difference in educational facilities and realized what a difference resources make. The drive has experienced challenges in the past, like time in 2008 when the delivery did not show up on time as lines grew outside the school. But most years, the distribution runs smoothly, and Shoshara credits the drive with spurring a number of positive outcomes at the school. For example, he says attendance at parent-teacher meetings has risen. If parents attended the meeting with their child’s teacher, they receive a ticket that allows them to go straight to the line on the day of the drive. “So the schools’ also figured a way out to incentivize this,” Shoshara said. A sense of the community’s wellbeing also motivates many of the drive’s volunteers. Andre Robertson, the manager of an auto tune up shop has been volunteering with the drive at Emmett Till for the last five years says he appreciates having the opportunity to come out and help others. During his time as a volunteer, Robertson said he has come to recognize regulars who collect their turkey each year.